That was the message at NSA North Sheep, The National Sheep Association’s, Northern biennial one day event, held at Crimple Head Farm, near Harrogate on Wednesday 5th June 2013. Within the region of 7000 people attended this year’s NSA North Sheep which focused on the future of the Sheep Farming Industry, attracted farmers, academics, industry experts, exhibitors associated businesses and breed societies from throughout the UK. Across the day, whether in opening speeches or seminars, speaker after speaker emphasised the role farmers in general and sheep farmers in particular, played in British food and the protection of rural life and landscape and how vital these roles were in the protection of everybody’s futures. NSA North Sheep acts as an industry forum and was used as a platform for the British Wool Marketing Board to announce their 2013 wool prices. Farmers saw the latest developments in flock management and healthcare as well as the commercial aspects of their business. The farming industry is facing many important changes and this year’s seminar programme looked in detail at the challenges and opportunities the industry faces in the future. Hugely popular during the day were the sponsored farm tours. The trip by trailer offered an oversight of the Wilson’s farming enterprises and also offered Yorkshire tasters of real ale and real pork pies and flapjacks from local makers, Kendall’s Butchers and Park View Bakery, of nearby Pateley Bridge. Crimple Head Farm is run by 3 generations in the name of J M Wilson and Sons. The 1000 acre farm runs flocks of 1000 horned Dalesbred ewes and 300 Masham and 50 Mule ewes along with 30 pure bred Texels and 100 head of breeding cattle. The Wilson family are very keen supporters of the National Sheep Association and the Sheep industry and David Wilson is himself Chairman of the Dalesbred Sheep Breeders’ Association. 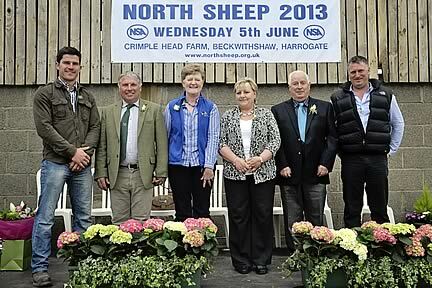 One of the highlights of the competitive spirit of North Sheep was clearly, on the day, the Shearing competition. Thought to be rare these days, the crowds flocked to see some of the North of England’s best shearers, with 30 year old Adam Berry of Kendal clipping his way to the trophy. Winners of the Stockjudging Competitions, sponsored by Carrs Billington Agriculture, were, in the Gents, Cecil Hutchinson, of East Harle; the Ladies, Margaret Iveson of High Force Farm, Bainbridge; 25 years and under, Eddie Heard; and 18 years and under, Henry Forsett. Entrants were required to show their keen eye for champion stock by judging four pens with Dalesbred, Teeswater, Mashams and Mules. The third NSA North Sheep Young Shepherd of the Year Award was made to a neighbour of the Wilson’s at Crimple Head - Josh Ryder of Central House Farm, Haverah Park near Harrogate. 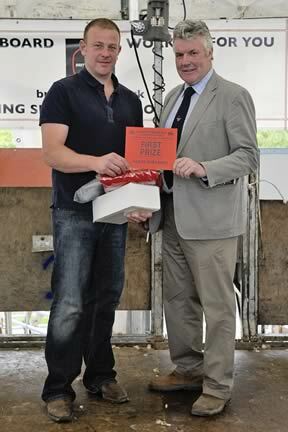 Receiving his trophy he emphasised that North Sheep is a flagship in farming. “This couldn’t be a better event to win it at, he added. Josh illustrates and confirms the spirit if the days’ opening speeches. He works at CCM auction and on the 300 acre family home farm where they run 1200 Dalesbred and Swaledale and a small herd of sucklers. Askham Bryan College sponsored the competition, and the young entrants (all under 26 years) performed five tasks – Stockjudging; lamb selection; shearing two sheep; answering questions on flock management and demonstrating dosing, vaccination and foot trimming skills. Josh will represent the NSA Northern Region at the final of the UK Young Shepherd of the Year to be held at NSA Sheep 2014, in Malvern, Worcestershire. 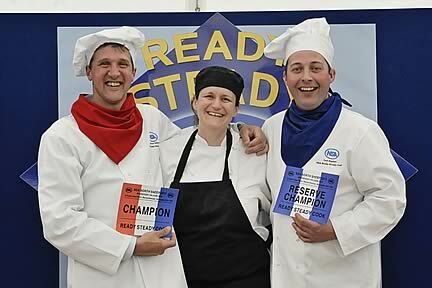 The highlight for those who enjoy the end product almost as much as the production was North Sheep’s very own popular version of Ready Steady Cook. The winning chef was is Andrew Atkinson, a lamb buyer of Felliscliffe Harrogate,, who clearly knows as much about preparing lamb as about purchasing it. Sponsored by CCM Auctions and featuring prime local lamb, the Heats involved the runner up, Ted Ogden from Craven Cattle Marts, Ian Smith from Wharfedale Farmers Mart, and Stephen Maskill, also a lamb buyer. Chefs were on hand from Harrogate College assisting. Celebrity chef Sophie Moon, and Northumberland’s Frankie Walton did a tremendous job of judging and humorously entertaining the audience. There was a fantastic showcase of trade stands, winning best indoor stand was Logie Durno Sheep, from Aberdeenshire, Best Outdoor Trade Stand, Ripon Farm Supplies, Wool on the Hoof was won by The North of England Mule, Lleyn Sheep Society.